Work is now almost complete on replacing Adelphi’s old temporary warehouse with a new building, The Friary, which has been erected over the top of the old “Tempastore” building. A canopy has been built to cover the space between the new building and Adelphi Healthcare Packaging’s modern warehouse facility completed in 2012, The Sheldonian. The canopy is designed to protect incoming deliveries (as well as delivery drivers and warehouse staff) from the elements on wet and windy days. A linkway has also been added between the Adelphi offices and the new warehouse, enabling staff to easily come and go between the two buildings. 9X 20 foot containers have been hired to temporarily store some of the stock from the old warehouse whilst work is underway. Benefits that come with the new warehouse include increased depth to the space used to store Packaging Machinery, Laboratory Equipment, and Process Equipment stock. The building will also now be used as workshop space for building the larger machines of Packaging Machinery’s, as well as an area for servicing machinery, and increased space for our weld shop. This will free up an area from our current workshop, which will be used as a demonstration area for customer visits. 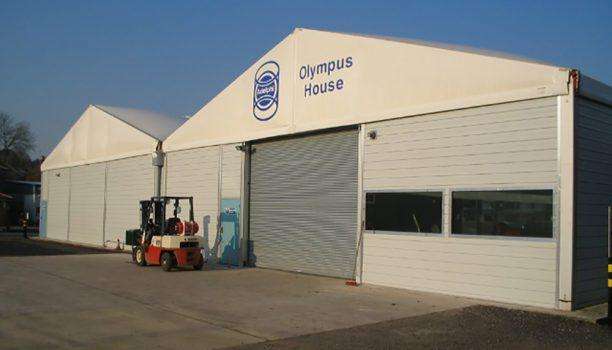 Our warehouse staff will be exceptionally pleased working in the new building, as the temporary warehouse was more than a little chilly in the winter months.